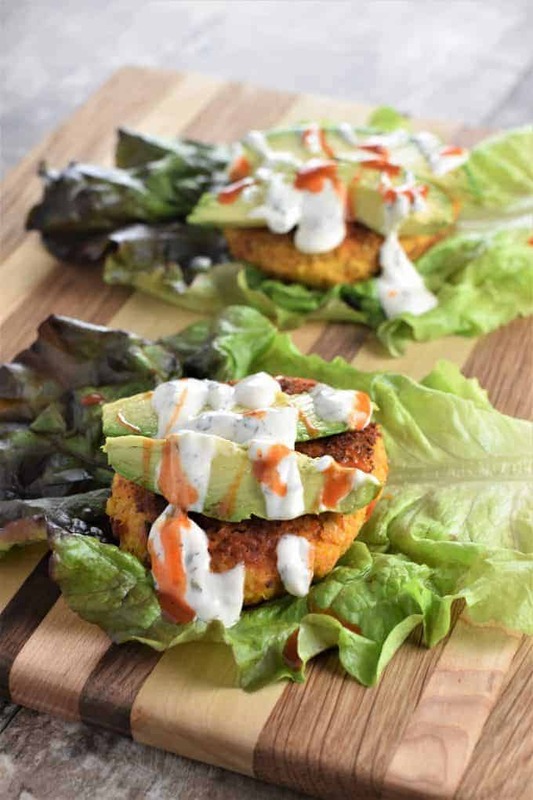 Chickpeas replace the chicken in these meatless Buffalo Chickpea Burgers, which are also gluten-free and can easily be made vegan. Seriously, I am soooo in ♥ with them. Can I let you in on a little secret? Would you believe these are the FIRST veggie burgers I ever made from scratch? For real! It’s true! So, I figured for my first go at it, I’d start by using my favorite legume…the chickpea. Although I have been dubbed “the hummus queen” among food blog friends (I label I am truly proud of), I’ve also made my fair share of non-hummus chickpea dishes as well. In fact, I’ve been experimenting with using chickpeas in place of chicken in all kinds of dishes, such as these Buffalo Chickpea Burgers which are a vegetarian variation of my Buffalo Chicken Burgers. I am also working on a recipe for “chicken-less” chickpea nuggets (hopefully coming soon to the blog). In the meantime, let’s focus on these burgers. 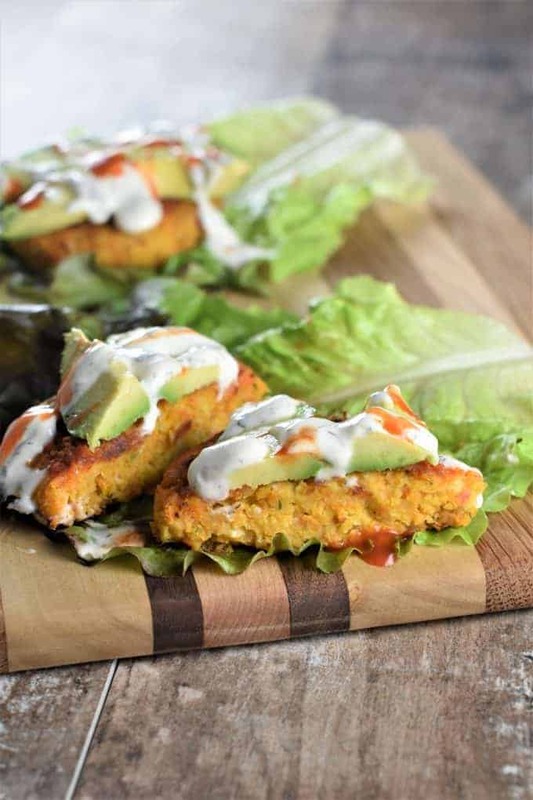 With a little sweetness from the carrot, a little tanginess from the Buffalo sauce and a LOT of deliciousness, these Buffalo Chickpea Burgers are not only tasty, but they are also gluten-free and can be made vegan too. Are these gluten-free veggie burgers grain-free too? While bread crumbs or oats are typically used for binding in veggie burgers, in this recipe chickpea flour replaces these grains. In addition, using a grain-free Buffalo sauce (one with vinegar that is derived from a non-grain source) will ensure that the burgers themselves remain grain-free. You can also keep your bun grain-free by using Against the Grain Gourmet brand rolls (FYI – these are not vegan). What Buffalo sauce brands are grain-free? Steve’s PaleoGoods (not vegan) and Noble Made (vegan) are two grain-free options. How can these veggie Burgers be made vegan? Simply use your favorite vegan Buffalo sauce and vegan toppings. Two Buffalo sauce brands that are both grain-free and vegan include Noble Made, as mentioned above, and Tessemae’s. All of the remaining ingredients in the burger itself are already vegan. To keep the “bun” grain-free, you can go with a lettuce wrap or try a grain-free tortilla such as the Siete brand. You can also use grain-free dressing such as Primal Kitchen’s Vegan Ranch. If you are okay with grain-derived products, you can also try these burgers with our homemade Vegan Ranch Dressing (the dressing is made with vegan mayo which often contains ingredients derived from grains, such as brown rice syrup). 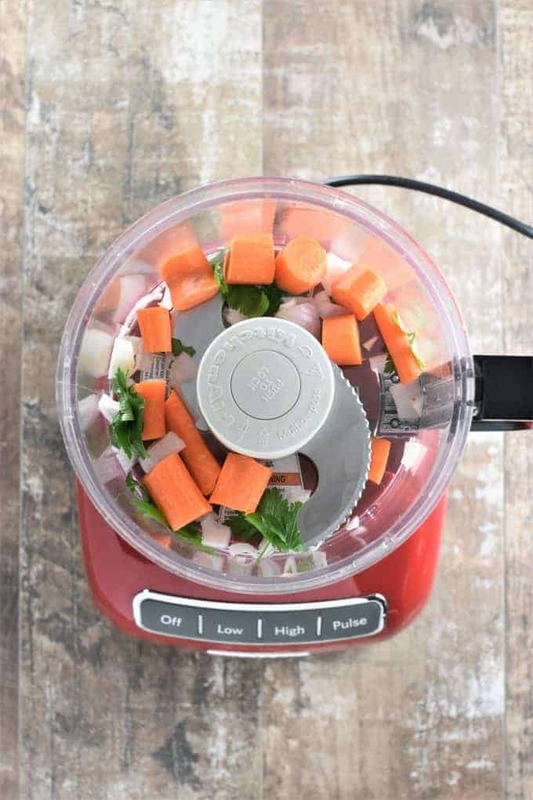 Start by adding the carrots, shallot and parsley to your food processor. Pulse until finely chopped, stopping periodically to scrape down the sides. Next, heat olive oil in an 8-inch non-stick skillet. Add the carrot mixture and salt, and cook over medium-low heat for 10 minutes, stirring occasionally. While the carrot mixture is cooking, rinse out your food processor and set aside as you will need to use it again. Once the carrot mixture is done cooking, allow it to cool for 1-2 minutes before adding to the food processor along with chickpeas. Blend carrot mixture and chickpeas on the low setting until everything is well-combined but not pureed, scraping down the sides as needed. Transfer the burger mixture to a large bowl. Add chickpea flour and Buffalo sauce. Mix until well-combined using a spoon or your hands. Using your hands, form 4 burger patties. Add olive oil to a 10-inch non-stick skillet and heat over medium heat. Add the burgers to the skilled and cook on medium to medium-low for 5 minutes. Carefully flip the burgers and cook for an additional 5 minutes. Add 1/2 teaspoon Buffalo sauce to the top of each burger. Then, carefully flip each burger and cook on low for 1 minute. Add an additional 1/2 teaspoon Buffalo sauce to the “new” top of each burger and carefully flip again. Cook for 1 more minute. Blend the carrots, shallot and parsley in food processor on the pulse setting until finely chopped, but not pureed. You may have to stop to scrape down the sides. Heat 1 tablespoon of olive oil in an 8-inch non-stick skillet. Add carrot mixture and salt. Cook carrot mixture on medium-low for 10 minutes, stirring occasionally. Allow to cool 1-2 minutes. While carrot mixture is cooking, rinse out the food processor and set aside. Add chickpeas and carrot mixture to the food processor. Process on low until everything is well-combined but not pureed, scraping down the sides as needed. Transfer chickpea mixture to a large bowl. Add chickpea flour and 1 tablespoon Buffalo sauce. Mix thoroughly using a spoon or your hands. Use your hands to form 4 burger patties. Heat 2 tablespoons of oil in a 10-inch non-stick skillet. Add burgers to the skillet and cook over medium to medium-low heat for 5 minutes. Carefully flip burgers and cook for 5 more minutes. Add ½ teaspoon Buffalo sauce to the top of each burger and carefully flip. Cook over low heat for 1 minute. Add an additional ½ teaspoon Buffalo sauce to the top of each burger and carefully flip. Cook an additional minute over low heat. Serve with desired toppings (see notes below). *To keep the overall burger grain-free, ensure the toppings you are using are grain-free as well. Please note nutrition calculation is for the burger itself and does not include any toppings or buns. Made the vegan version of this for dinner the other night for my family (they aren’t vegan) and everyone LOVED IT! We added your vegan ranch dressing on top with avocados. Definitely going to be a repeat dish in our house this summer. These look divine! I’m going to have to drizzle it with your avocado bleu cheese. Yummy! Feeling better with less meat and more vegan meals. This is one delicious way to enjoy meatless Mondays. Look crispy and delicious!